The Miriam’s series follows a hard-working, East-End woman, and her close family, from her father’s birth through to the end of her life, taking in two World Wars and everything else that she experienced in the twentieth century; incarceration, children, husbands, new experiences, great friends, and deaths. (spoiler alert - details below) The Miriam novels are not about excitement, tension and the resolving of mysteries. They are about getting to know a London family, experiencing their lives and even perhaps learning to love them. All available on the Kindle. A Year in Holloway. 1938. Mrs Miriam Baxter, an ordinary housewife and mother of two small children, committed a misdemeanour in the form of theft. Her punishment was to be imprisoned in the infamous woman's gaol, Holloway, House of Correction, North London. Placed with the type of women, with whom she had never been in contact, Miriam has to learn to survive in a harsh environment that took away her freedom, her family and everything she had ever known. Written with the help of authentic documents of the period, A Year In Holloway, details exactly what it would have been like to suffer imprisonment in a woman's prison just before the beginning of the Second World War. Miriam's War. Mrs Miriam Baxter, an ordinary London housewife, apart from being an ex convict, is devoted entirely to her family, which consists of her two children, parents and three sisters. She would call herself unremarkable. However, it was her determination and courage which took her and her family through the Second World War. In Miriam's War, there are no hints of heightened suspense, no clues as to where her story could veer to; it just is. Miriam's Family Life. It is the summer of 1945, and Miriam and her extended family are weary but disciplined by war, and accustomed to austerity. Throughout this period, she deals with more deaths, ill health, moving house, rationing and accidents; all the while guiding her loved ones through the deprivation and destitution that is the East-End of London. Yet, there are births, a new relationship for her and marriages. Conscription and the introduction of the National Health arrive at the end in 1948. As with, Miriam's War, and, A Year in Holloway, she copes daily, struggling with a situation that is unique and difficult. Her pathos, determination, humour and love are all she has. Miriam’s Silver Years part one is the fourth in a series of novels describing the life and family of Miriam Barker, née Baxter, a busy East London woman who was born in 1907. This edition deals with the years 1948 to 1955, a period when rationing and coupons still applied, and the long shadow of the Second World War still hung over Britain. 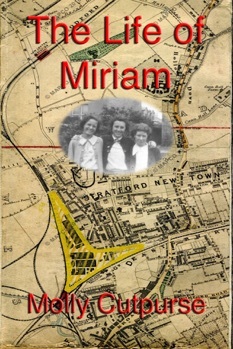 Through the threads of Miriam and her three sisters, we see how they cope with their increasingly complicated lives; the introduction of self-employment, marriages, births, deaths, moving house and television, as they embraced the second half of the twentieth century, and the radical changes which followed World War Two. Miriam’s Silver Years part two is the sixth story about Miriam Barker and takes place between the turbulent year of 1955 and the stimulating one of 1963. During this crucial time, a previously unknown family member shockingly makes himself known, she enjoys the holiday of a lifetime, the hub of her close family falls apart and she makes a final decision whether to stay in the East End or live out her years by the coast. The Second World War and her time in Holloway Prison is now a distant memory. However, apart from the changes in her family, particularly as the decade of the, ’swinging sixties’ arrive, she retains the love of her loyal husband, Roy, and still enjoys her enduring friendship with Rafa. Miriam is now a dutiful grandmother, an extraordinarily fabulous aunt of an ever-increasingly large family, a servant of the community, and as a woman proudly moving from middle age into the remaining years of her life, a matriarchal force to be reckoned with. Miriam’s Golden Years takes us from 1963 until the nineteen nineties. A period when she bore the many deaths of her family and friends with dignity, but is more than pleased to welcome the beginning of her grandchildren, great grandchildren and great nephews and nieces, despite all their singular problems. Equally remarkable, as the rest of her life had been, Miriam finds herself wrestling with the problems of social and political violence, the rise of female emancipation, decimalisation and the acceptance of becoming elderly while still caring deeply for her extended family and her beloved husband, Roy. She has now gone beyond a matriarchal figure. She is host to memories long forgotten, a contributor to a decent way of life fast disappearing and part of a proud East End dynasty that her descendants will never forget. Miriam’s Last Year. Miriam is now eighty-seven and after Roy’s death, still lives in the large vicarage in Wanstead alongside Rafa, Florence and her twin girls, Faith and Betty. It is now a time of reflection, the promise of a great, great grandchild, and long conversations about the events and conditions that shaped her life. Yet even as her body moves inexorably into extreme old age, events continue around her that proves that even wheelchair bound, her clear and sound mind, alongside her remarkable memory, can still dispense positive advice and be more than useful to those who are charged with caring for her. Miriam’s Last Year also sees Rafa Barker in her twilight years when she too has become alone once more, abandoned by her one and only daughter over a shameful event from which she cannot face. A time when, surrounded by her close family and friend, she too takes a reflective sad look back on a lifetime of service and love as she cares for Miriam during her final days.